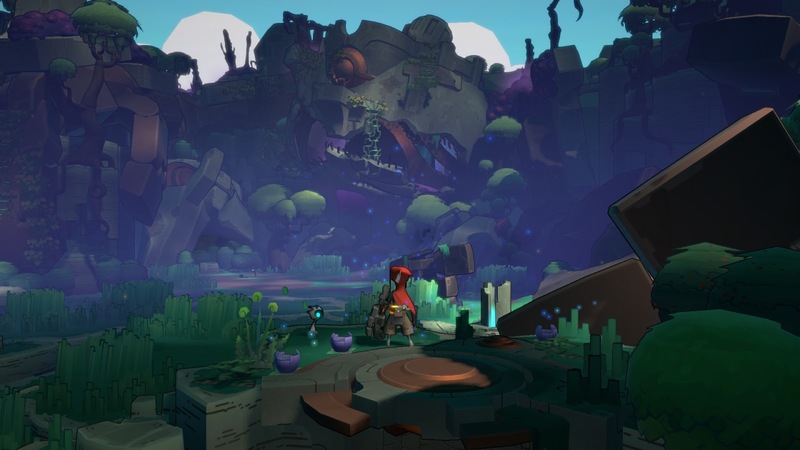 We sat down with Marsh Lefler, President of Runic Games, at PAX to talk about Hob. The third game from the Seattle based company, Hob is an adventure game set in a strange world humming with life and mysterious technology. As you traverse this world you will learn more about where you are and what your role is. We arrived at Runic's booth very curious about Hob, and our time there left us even hungrier for details. Our demo was short, but we got a taste for the things to come. I was immediately drawn to the game world. Verdant green trees, roots and vines resembling circuits and wires. In the distance we could hear the calls of various animals, hopefully friendly. The first enemies we encountered were bat-like, with long bony snouts. With a button press, my character drew a sword and stood poised for combat. Attacks functioned in a familiar combo method. Finding the cadence of each swing, I was quickly stringing multiple attacks together, making short work of the pack of scavengers. Soon after we were wandering through side paths and clamoring up ledges, when Marsh pointed out one of Hob's interesting features. 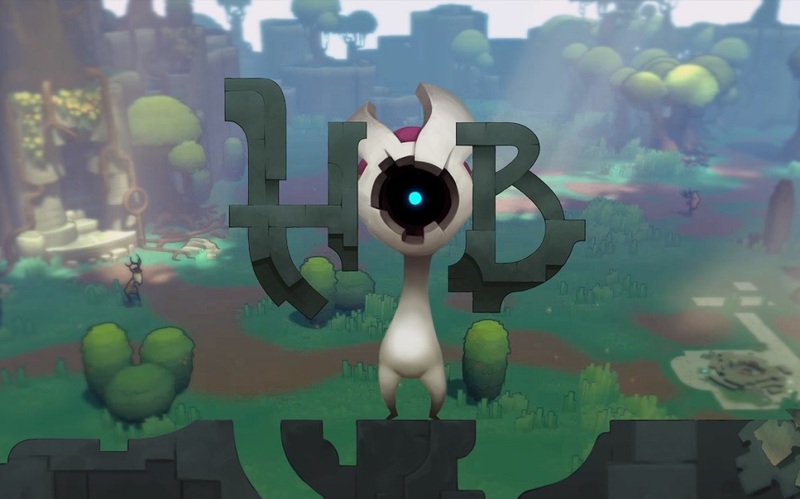 Unlike many action RPG's, Hob doesn't allow the player to control the camera. Marsh explained that this was a very deliberate choice, allowing them to create vignettes from time to time and pointing out things happening around the player that are important to the narrative. Focusing the player's attention is very important, as the game contains no dialogue whatsoever. Can you make out the giant robot? I know many gamers reaction to uncontrollable cameras is to cringe and fret, but in our 40 minute demo, we never lost track of the character on the screen, an impressive feat in a game world that so often moves and changes. Reaching a high ledge, the camera pulled out, revealing that we were standing atop the ruins of a gigantic robot, a detail that we wouldn't have otherwise been able to discern, covered as it was in moss and vines. We slotted a block into a space in the wall, opening an elevator that took us below the forest into a dark, shifting mass of machinery. Until this point, we hadn't found many other uses for the large gauntlet the character wears on it's left hand. But here in the world's underbelly, Marsh walked us through some of the details of the massive, armored glove. It has many uses, most of which are unlocked by discovering modules for it. In the cavern, we used a magnetic grappling hook to latch onto pillars and swing from wall to wall. Later, we used the same ability to pull armor off of a large, trollish enemy, hinting at a certain versatility to the modules rather than the Zelda standard of "one item, one use." Some concept art showing the gauntlet equipped with various modules. 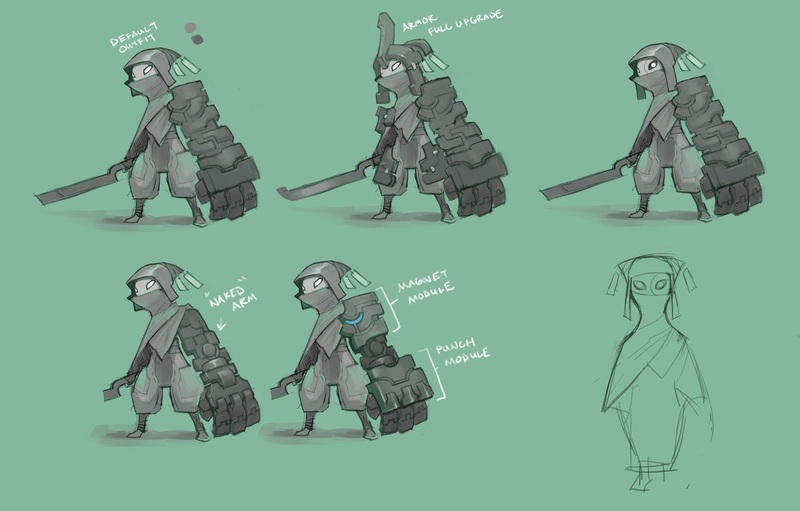 There is so much more to Hob, but for now, Runic is keeping very quiet about it. We have a lot of questions about the world, and I think they like it that way. It's that curiosity the team is counting on to drive players to work out the game's secrets. From our impressions at PAX, that curiosity won't be hard to catch; Hob is delightful, strange and so very, very intriguing.